So where are the (second) highest tides in the world? “The king of all Australian tides occurs near the town of Derby in King Sound, in north-west Australia, at the end of March and again at the end of April each year. Derby’s tides can reach up to 11.8 m and are the second biggest tides in the world (the largest, clocked at 15 m, occur in the Bay of Fundy, Nova Scotia.” (Source). So Australia, on the face of it, seems to have the second highest tides. But the tides in the Bristol Channel are also routinely claimed to be the second highest tides in the world (not least on this blog), and this claim has, in the past, also been made for the tides in Kamchatka. Perhaps such claim and counter claim is inevitable because we are talking differences of centimetres here. 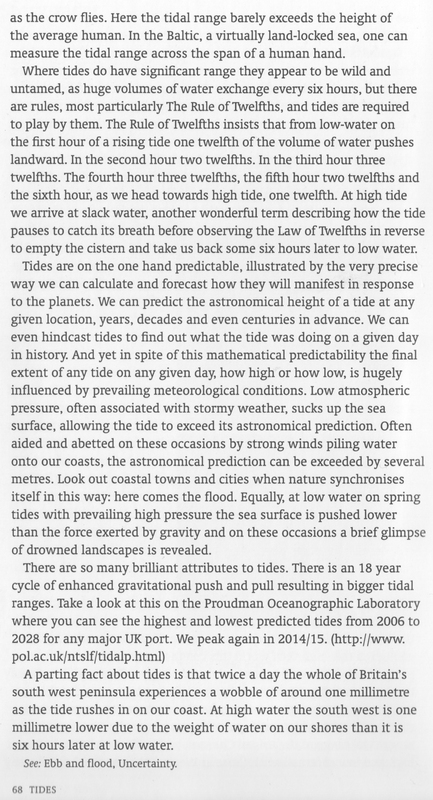 And, as will be set out, although tides are generally highly predictable – their actual height on any give high tide can vary, and become uncertain, in relation to the effects of wind direction, atmospheric pressure and other conditions. And there is also – it seems – some question around what datum are being used to determined height data. To be investigated further. Here is the entry on Tides in the great book Anticipatory History. Edited by Caitlin DeSilvey, Simon Naylor and Colin Sacett. I was watching a program about the Korean War which said there were 33 foot tides somewhere on the Korean Peninsula, ‘the highest in the world’. I live along the Knik Arm of the Cook Inlet so I know better, but had to check to see if any Korean tides were even on the list. I have seen a couple other examples over the years that shows a lot of people don’t know anything about tides. Hi thanks – interesting – 33ft is certainly not the highest, and yes it seems to be an example of people saying some or other tide is one of the highest – for dramatic effect. The river Mersey in Liverpool UK is higher that most of them, your facts are wrong!! Hi. Thanks. According to the National Oceanography Survey, the highest Tide in Avonmouth between 2008 and 2026 is 14.65 metres. Liverpool is stated to be 10.37 metres. Other places along the Bristol channel are listed as having higher tides that Liverpool. Other places too – like Llandudno. If you want to check this information go to http://www.ntslf.org/tides/hilo. If you have information that shows a differing set of figures I would like to see it and gladly link to it.